"How did we get here?" is one of the essential questions right now in American politics. How did we go from a country that elected Barack Obama twice to one that, popular vote loss aside, elected Donald Trump? Two words: Rush Limbaugh. The Tribalization of Politics explores how the conservative radio host "tribalized" our politics through his racially divisive, falsehood-ridden portrayal of President Obama. By playing and preying on white anxiety, Limbaugh laid the groundwork for the election of a president who essentially adopted his view of the Obama presidency. During Obama's eight years in office, Limbaugh repeatedly used a technique called "racial priming" against America's first black president--language designed to heighten white racial or cultural resentment. Limbaugh's aim was to convince his audience that Obama was anti-white, anti-American, radical, Marxist, black nationalist, among other labels. 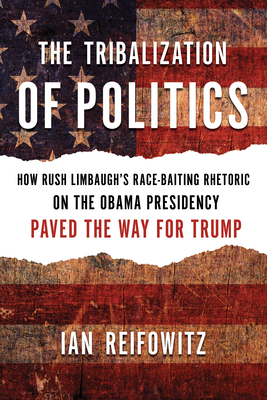 Limbaugh's divisive rhetoric against Obama was designed to cleave America in two, creating a conservative "tribe" animated by passionate racial and cultural hatred toward the opposing tribe. A vital analysis of the assault on truth and accuracy carried out by right-wing media as well as by politicians like Trump, The Tribalization of Politics reveals how the race baiting rhetoric of the most popular radio host in America against President Obama helped elect our current president, in the process threatening the democratic principles upon which our country was built. Ian Reifowitz is a professor of history at Empire State College of the State University of New York. He is the author of Obama's America: A Transformative Vision of Our National Identity (Potomac Books, 2012). Ian is also a Contributing Editor at Daily Kos, and his articles have appeared in the Daily News, Newsday, the New Republic, In These Times, Post-Star, Truthout, the Kyiv Post (Kiev), Huffington Post, among other outlets.